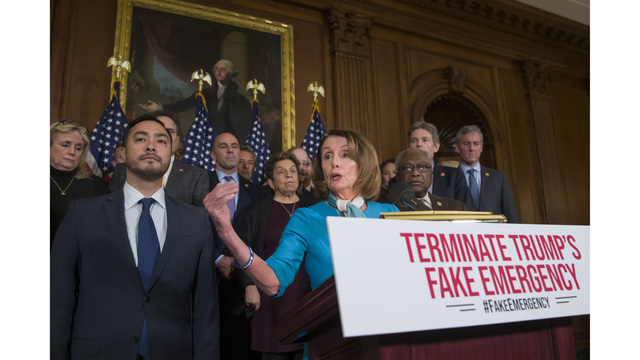 WASHINGTON (AP) - The House has voted to block President Donald Trump's emergency declaration, a measure intended to get him billions of extra dollars to build his border wall. Democrats pushed the measure through the chamber by 245-182, with 13 Republicans joining them. Passage by the GOP-led Senate seems possible next month. At least four Republican senators may back the Democrats' resolution. Trump has formally issued his veto threat. Congress seems unlikely to amass the two-thirds majorities needed to override the veto, which would be his first. The battle makes GOP lawmakers choose between backing Trump and defending Congress' control over spending. Trump says there's a border crisis and he needs more than the $1.4 billion Congress provided for barrier construction. Democrats say there's no crisis and Trump is trying to work around Congress.